This home is located in a residential suburban neighborhood in Farmington, CT. 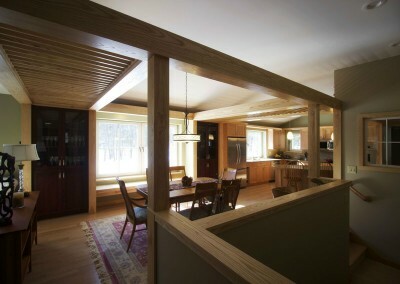 The sloped site lent itself to an “upside down” floor plan that locates a main living space and master suite above a lower level with flexible uses and generous daylight. The simple rectangular form is optimized for solar orientation and shading. It extends to contain an ample garage, generous covered front entry, and rear screen porch. Tree clearing required for the drive approach to the south assured good solar exposure. 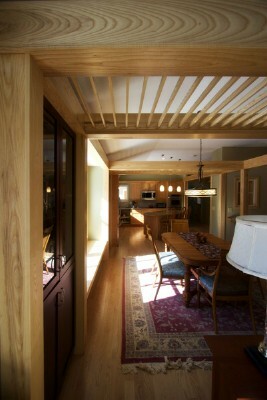 The building’s simple forms are expressed with craft detail. Materials were selected for durability and beauty. Tilt turn windows allowed larger south facing openings with a cross muntin pattern that kept them in scale with the traditional and familiar building style. Framing was designed to align these openings to minimize thermal bridging. The double stud “sandwich wall” workflow and scissor truss roof follow familiar framing and mechanical rough in methods while providing a visible and verifiable air barrier the trades learn to honor and protect. The air tightness was measured at 0.49 ACH50. The building was designed using PHPP to optimize free gains and allow a single ducted minisplit to satisfy the small heating and cooling loads with a single supply to each level. The Zehnder HRV provides balanced heat recovery ventilation. Enclosed space beneath the scissor truss interior slope along the north side of the first floor provides a location for the air handler and distribution paths within the envelope. Domestic hot water is provided by a heat pump water heater. 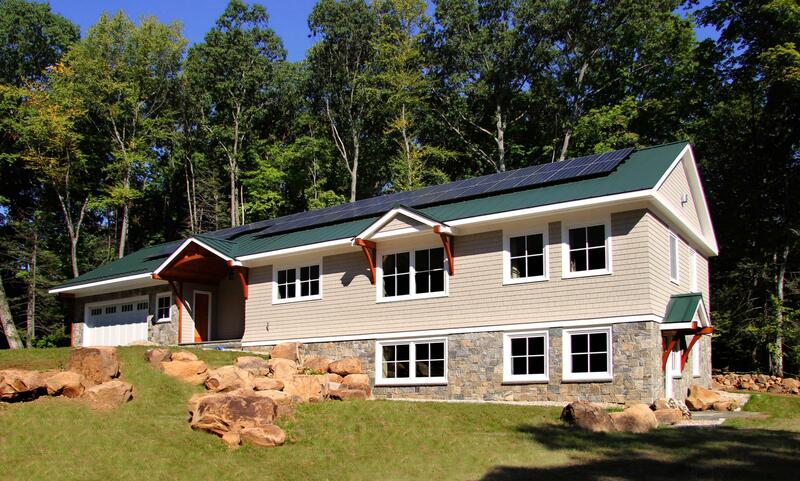 This project won the grand prize in the 2013 CT Zero Energy Challenge. During construction the public was invited to an Open Wall Open House to learn about and see how it is constructed and was open again after completion as part of ASES National Solar Homes Tour. Construction methods were shared with professionals at a NESEA BE Local event. The home was open to the public during a local effort to encourage town residents to install Solar PV (Solarize Farmington) where the home owners functioned as Solar Ambassadors. 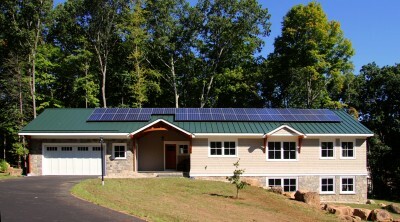 This 20 week program resulted in 90 signed contracts to install solar PV in Farmington homes. Our intentions for undertaking this project included several major goals. These included creating a home where: all space was of use, it would be easy to maintain, the layout would allow us to age in place, and energy efficiency was a focus. Energy efficiency was important both to make the home comfortable and energy costs predictable when living in retirement. 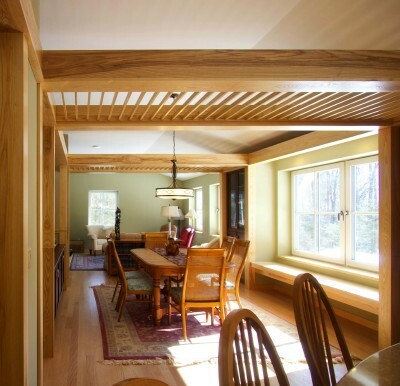 Although the original intention was not necessarily to build a net zero home, information sources like the Green Building Advisor and the CT Zero Energy Challenge led us to Jamie Wolf, who showed us what was possible within our budget. Jamie’s design allowed us to accomplish all of our goals without compromise. Not only did we achieve net zero, but the inherent low load home design allowed us to build excess PV capacity with future plans to buy an Electric Vehicle.